Getting there: Google "Hickory Hills Ski Area, Traverse City 49684"
What's there: Hickory Hills has 4.5 hilly kilometers of Beginner to advanced cross-country ski trails on the west side of Traverse City. There are also snowshoe trails winding through the surrounding forest, as well as a 1 Km lighted cross-country loop for night skiing. 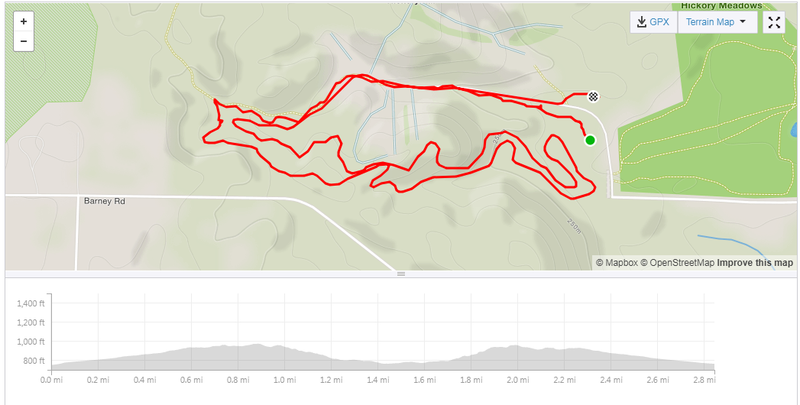 John Kostrzewa notes, "The trail is only partially lit, but visibility from the Alpine area lights and the Nordic sections that are lit, make it easy to see on all 4.5K of this challenging loop." NORDIC Ski rentals are not available at Hickory Hills but there are several nearby outfitters who rent cross-country skis to visitors. Hickory Hills has a New Lodge under construction, plus the old warming hut and bathrooms. Adjacent to Hickory Hills is Hickory Meadows, where there is an additional mostly flatter and rolling multi-use 4K groomed trail. Trail is shared with walkers, snowshoers, skaters and classic. Hickory Hills grooms it. No fee, but ski memberships at Hickory and daily passes are appreciated from those who can help support grooming and trail maintenance. Hickory Meadows is Parkland with no buildings or restrooms on their park property.